Rugged plastic housing with adjustable feet to give individual comfort. One LED per key lights the individual characters - and they will never rub off! The Deck 105 key Legend measures 18.5" long x 7" deep x 2" high (with feet raised) and weighs 3.5 pounds. And as always this Deck carries our 1 year warranty. 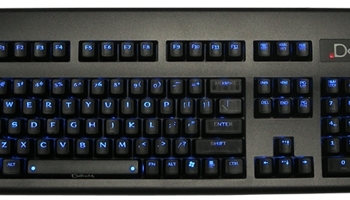 Blue backlit, tactile keyboard. The keyboard interface can be changed from PS/2 to USB and vice-versa. Converting the keyboard from USB to PS/2 is not recommended unless you are competent at desoldering electronic components. Please read all instructions before beginning. the data cord into the Type A receptacle which is located at “J2”. Use a soldering iron and solder removal tool to remove the lead clippings from “W3”. Then solder a through-hole, 10K, 1/4W, 5% resistor at “W3”. Reverse the steps to reassemble the keyboard and follow the PS/2 installation instructions.